Edit:I have fixed and improved this run, these are the new files. If somebody think that only finishing ClassS or ClassZ is better, You can see this. The file classS is not equal to this full tas. 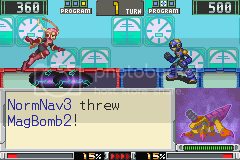 This is a megaman-battle-network game which takes place somewhere between exe3 and exe4. But this isn't an ARPG game. It's a card battle game. There are the six characters available for you to choose. Each character has his/her own story. What's meaning about no code? After ClassE, the Host Battle has been unlocked. 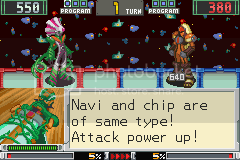 Now you can input the Navi-code that contain the rare chips into the tournament's section, then battle them and win them. I can get any chips which I want, so this is really a bad idea like use cheat. 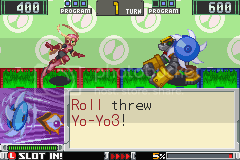 Why did I choose Roll? 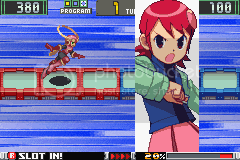 Compare these characters, and Roll has the high evasion A, and roll's Heart Flash cost less time than others. Megaman's charge shot and Ring's Ring Boomerang are the last delete atk, protoman's Sonic Boom is random delete atk. These cost more time, and I don't need these effect. The important reason, I can get YoYo3(150atk) from Colourman early after Healing tournament. But I can't beat Roll in Open Hacker's N or other place like other characters. 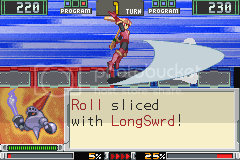 Because roll has the low HP, and can be easy to delete with Gaiasword, so it still hard to say roll is the best. All the chips I used. I got ZapRing3, Yo-Yo2, Dynawave these three chips from shop in the beginning. ZapRing3 is the best chip, it can stun enemy, and prevent enemy to use the navi chip. Dynawave is the max power chip which I can buy except unstable Meteor4. Yo-Yo2 can be used on hole stage. I can get MegaCannon from this shop, but I need to wait too long time, so I give up it. 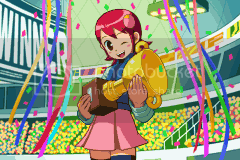 I beat Healing tournament second for Colourman's YoYo3. And then, I buy the chips again. Get 25. LongSword 29. FireBlade 30. AquaBlade * 2 31. ElecBlade 50. Cannon Ball 65. RabiRing3 92. Meteor4. These chips will be used for classD except 50. CannonBall. I have to face ThunderMan's Remo-kogoro1 in ClassC, so use CannonBall to break it. At this, I think if I can get HiCannon from Ring or NormalNaviV2, I have got one more choice to use manipulate luck, not only use Longsword. 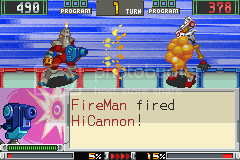 I got first HiCannon until beat Guts tournament's Gutsman. In ClassD, Get ForestBomb3 from Woodman, GutsPunch from Gutsman, FireSword from Fireman, AquaSword from Iceman. 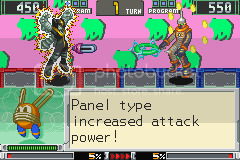 ElecSword from Elecman. Now I'm sure these chips are all necessary. Because sword's accuracy is C, and the blade's accuracy is D. I can use manipulate luck to choose RNG. In ClassC, succeed get 2nd Yo-Yo3 from Colourman and 2nd Fireblade from NormalNaviv2. In ClassB, get the very important chip GoldFist from MetalMan. In ClassA, I got another important chip Meteor5 from MagicMan. In ClassS, get the 2nd GoldFist from MetalMan,but getting two GoldFist is very necessary. After ClassS, I can get a Random Chip from #172-#181, but the best chip of them is 175.GaiaSword. 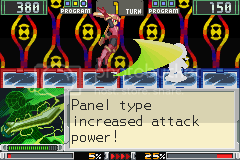 For getting it, I waste a few hundred frames when beat with Kingman and Protoman, and you can see I use some low power chips. The Navi chips I used. I find that change to different NAVI will cost different frames, usually cost more than 260 frames, and some Navis cost more than 350 frames. Use a normal chip usually costs less than 200 frames. So if I want to use Navi chips, it must be saved the time what 2 chips be cost, e.g. I use once and opponent uses once. 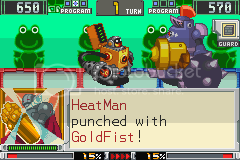 I use Heatman change the Fireman, because Heatman has the high HP, the high evasion, and the high Navi attack. As the same reason, Iceman is better than Freezeman. Elecman is not better than Flashman, but it near the end, and no need to change. 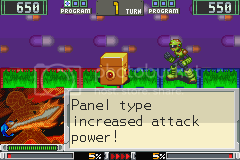 I choose Plantman not Woodman to use Gaiasword. Because when changes NAVI, change to Plantman is 12 frames slower than Woodman, but when uses sword, Plantman is 17 frames faster than Woodman. 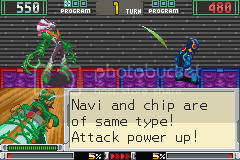 In this game, different Navi using the same chip will cost different time. 0x020070F8(2bytes) is random's address. I always dump about 500 frames' random changes in the chose screen before battles. It can help me find how the RNG work. When shopping, random number stops. When buying one chip, RN array's point+2(*P+2). When buying 10 chips, RN array's point is always add more than 20, because some rare chips can be bought when you buy 10 chips. Battle begin, *P+8. Because it needs 8 RNs choose the chips. I don't know why it is 8 not 6. 1. 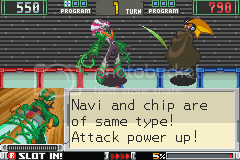 If both Navi's chips have the same Priority and no element restraint, *p+1 to judge who use chip first. 2. If chip's accuracy is equal to or lower than Navi's evasion, *p+1 to judge hit Navi or not. 3. 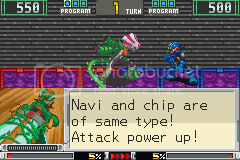 When use random chips, like sword, kunai or Meteor: Sword(if it has hit Navi), *p+1 to judge hit which chip. Kunai(if it has hit Navi, must hit 3 times), *p+3 to judge these 3 times hit which chips. Meteor4, *p+4 to judge every meteor hit or not, and no need to judge the rule No.2. 4. Use one chip, *p+1, no matter what happened e.g. fails, be stunned, no effect. 5. 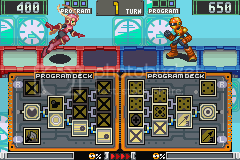 Delete opponent's Navi, *p+1. 6. Judge get chip or not, *p+2. About level: The higher level, the more chance get chip; The more chips in deck (not include slot-in chips), the higher level; The less be damaged, the higher level; The less chips be deleted, the higher level; Use slot-in chips would reduce level, but if this slot-in chip is recovery chip, maybe rise level. 8. slot-in chip. 3 cases: slot-success, slot-fail, slot-last. Slot-in, *p+1 to judge success or fail no matter what the slot-value is 100. So I always use it to make manipulate luck. What's meaning slot-last? In fact, slot-last is a glitch. When your last attack may delete opponent, you can't slot in chip unless your attack misses. But at the first frames which you use your last chip, you still can pass R or L to slot in. However the random number didn't change, because the system hasn't judge this slot-in success or fail. 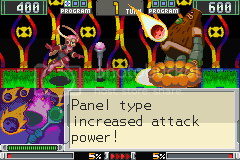 But system has judge that you have use a slot-in chip, so can reduce the level after battle. Generally speaking, slot-last's only effect is reduce the level and fail to get chip, and then change the random. But it has the very low chance to change the random, because in most case, level S has the same effect as level 10 or level 9, only get the more money. In fact, when I found this glitch, I have completed ClassZ, so I only use this glitch twice. After complete ClassZ, Open Battle's HackersN has been unlocked. Now I can beat this game's real final boss, BassGS. But before beat him, I need to complete 99 battles first. 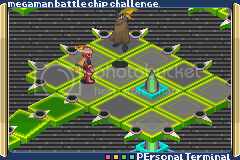 Open Battle is not similar to Battle chip GP, because the opponent is random, except Opponent 5,10,...,95,100. So it is important to use manipulate luck to choose the easy opponent. I found this address 0x02008831(1byte) is a flag to display Navi. Which opponent Navi is better or worse? I can use Roll with Gaiasword hit them only once. 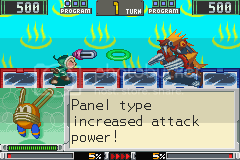 But Sharkman's evasion A is very high when on the ice stage. Most of them, I can use Plantman with Gaiasword hit them only once. 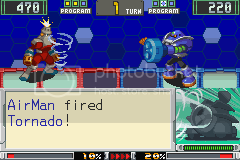 I can use Roll beat Toadman and Magicman, but Toadman must not use BblWrap, and Roll must avoid Magicman's first attack(firebalde). 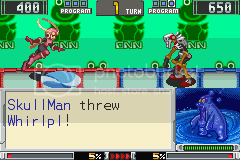 Toadman has the highest evasion S with the ice stage, so it's very hard to hit him. These Navi's first chips' Priority is higher than Gaiasword, and theirs accuracy is too high to avoid. Them have the very high HP, Plantman can't beat them with one hit. It's very hard to avoid Iceman's sword or blade, and one of my chips must be deleted. Airman appears with Hole Stage. This is a list of all the Navis who I meet. Two Colourman? Yes, because this is the Roll's story. Or you can download this expatiation 2000 RNs dump. Before beat with BassGS, I pass Start and choose chat to change RNG when edit chips in the Program Deck. It only cost 233 frames, but it break the original RNG rule. The random result bases on Deck's chips (not include slot-in chips), chips' location, Navi chip. If I widely use it, I could manipulate luck to choose all easy enemies in Open Battle, and save lots of frames. But I don't know how to control this. Nach: While this may be a very optimal run through a game, I'm not finding a game which is solely about going through menus as fast as possible to be very entertaining. Furthermore, technically, a good TAS depends on more than just optimal speed, or abusing random number generators. Good TASs consist of so much more. This might be a good TAS of the game, for what little it has to offer, but I'm finding it lacking in offering anything to TASing in general, and the game itself is quite boring. Rejecting. FractalFusion: Setting to delayed because of the above improvement that should be checked. FractalFusion: Replaced movie file with above movie file which is about 2 minutes faster. Setting back to accepted (for vault).